The origin of the Games dates back to the Japanese colonial period when the two rivals Bosung College and Yonhi College began holding sporting events that helped many Korean people endure the hardships of colonial rule. 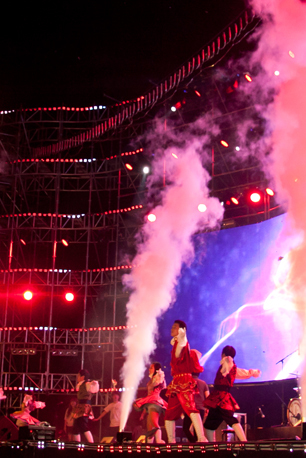 Over the past 80 years, Ko-Yon-Jeon has radiated the burning passion of youth, having become a festival of not simply two universities, but also the whole country. Today, together with the five matches of football (soccer), baseball, basketball, ice hockey, and rugby, the Games have developed into a variety of celebrations such as joint academic and broadcasting events and exchanges among departments and clubs. Ko-Yon-Jeon and the two prestigious rival universities will continue in everlasting friendship. 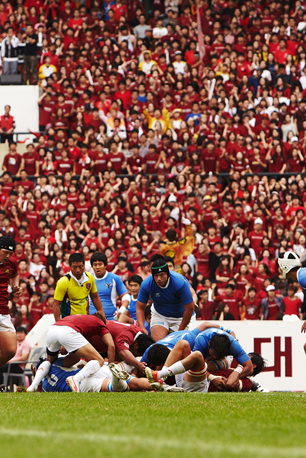 Visit the Korea University Sports Committee website for detailed schedules and past results regarding the annual Ko-Yon-Jeon. With the start of the first Great Granite Tower Festival on May 5, 1962 in which students, faculty members, alumni, school parents, and the local community gathered together to create a new chapter in Korean university culture, the festival since then continues to bring colleges, departments, and club activities together to celebrate the intellectual spirit and romance of campus life by hosting various events on campus throughout the festival period. 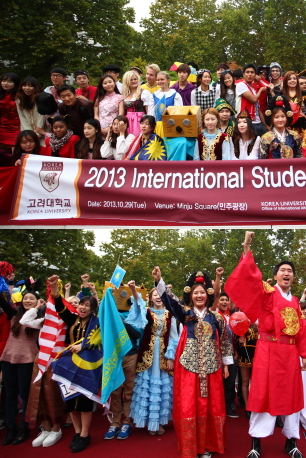 Academic seminars of sharp analysis and discussion, joint broadcasting events with Yonsei University, and street festivals on Chamsari Street are some of the events that goes on through the duration of the week building up to the most passionate and popular event of them all, the Ipselenti cheering festival where the roar of “Ji-Ya (Wisdom and Wilderness)” is released. On April 18, 1960, 3,000 KU students stood up against the injustice and dictatorship of the Liberal regime. After reading a declaration denouncing President Rhee, they ran out of the school and headed to the National Assembly Building. On their way back to school after the protest, KU students were assaulted by political hoodlums. This assault on peaceful student protesters triggered anger and frustration among fellow students as well as the public which cause the historic event that is now the 4.19 Revolution. 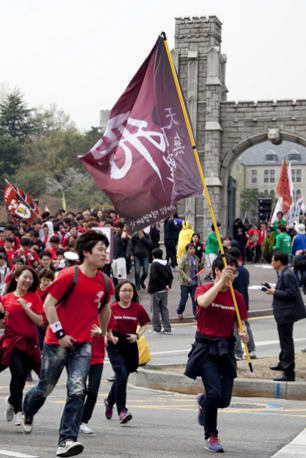 To commemorate this historic event and to continue the will of the brave KU students of the past, every year on April 18 students run a marathon from the main gate of the school to the April 19th Memorial Grave Site in Suyu and pay their respects to the martyrs of the democratization of Korea, and this event is called the “4.18 Marathon”. The festival provides an opportunity for international students to interact with one another in order to build understanding and communication between different cultures by shearing their traditions, foods, and travels with each other. Throughout the event, booths that promote the national and regional cultures are prepared for students to experience and enjoy various traditional foods and cultural activities.